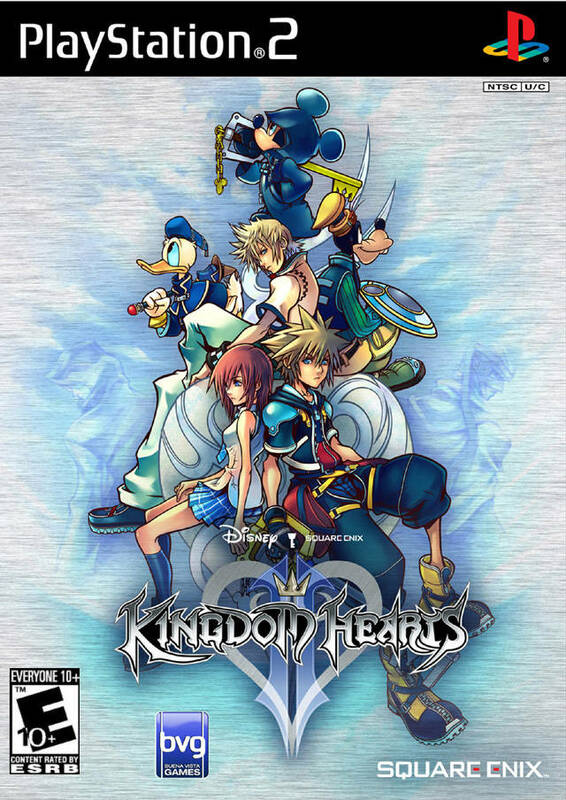 Kingdom Hearts II is the sequel to the action role-playing game featuring a host of familiar characters from movies and video games alike. The story begins in Twilight Town, a quite burg nestled between night and day. Sora and friends are joined by a vibrant new cast of characters, including King Mickey himself! Together, they will encounter countless dangers in worlds both familiar and brand new. Explore both new and familiar worlds from Kingdom Hearts, plus new Disney worlds to the Kingdom Hearts franchise, such as Pirates of the Caribbean, Beauty and the Beast and Mulan! 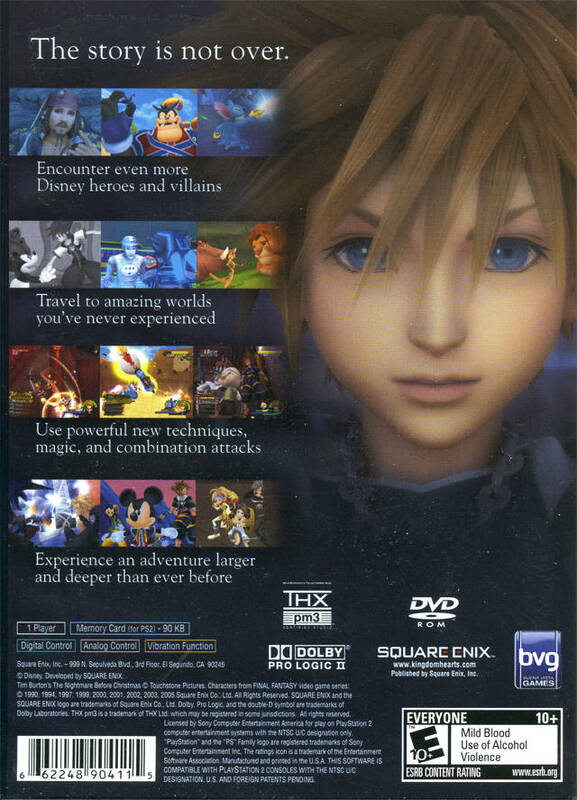 When I first heard about this game, even though I enjoy both, I had a hard time contemplating how a story with both characters from Disney and the Final Fantasy series, could make a good game. But after playing for awhile, i found myself pleasantly surprised. This game has an interesting story that only increases from the original in this sequel, fun game play, and easy to pick up controls. Also, I enjoyed the humor inter spaced throughout the game play, and the nostalgia feelings grew as I traveled throughout the game. It presented a challenge at times, but not enough to make you want to quit. If you are the type of person who enjoys the stories in games, I would suggest playing the original Kingdom Hearts first before this one, because it can be hard to understand what was happening at times. But if you don't, I found that I enjoyed the controls, and the fact that the story felt more deeper in this sequel. If you enjoy adventure games, that can be enjoyed by the whole family, I would recommend you give this one a try. Disk buffers and lags although disk seems spotless and without a scratch. I assume the disk has been refurbished, no complaints but the game should be fully functional before being sold to a customer. I love this game as much as the first one. I'm only I'd say about half way through but so far it's excellent. Great characters, great story and awesome graphics. I just wish I had more time to play it. it's easy to find those items that no one else has Lukie games. customer service is great. it's so easy to buy and your items come quickly in the mail. you get exactly what you paid for it and there's no problems. thanks Lukie games. My son absolutely loves this game it came in great condition though it take take a little longer than expected. But prices are good so I suppose it equals out. Fast shipping! Great quality! Very impressed! Got the game for a great price and it was still new with no scratches whatsoever. I was really surprised! I was expecting just a few little scratches but nope. super duper new and clean!! A awesome play it mixes final fantasy with all your favorite Disney characters. I am still waiting for kingdom hearts 3 and can't wait to see what they do with it. My opinion a must have.